Creating space to come together. Inspired by a talk on the importance of having a supportive group of women in your life at 2016’s elaConf, I created Shine Lancaster. It was inspired by giving space for women to support one another. It initially began as a women in tech meetup, in January 2017. I created it with the hopes and aspirations of it eventually growing into a community where women could find support, mentors, learn new skills and more. Lancaster has an incredibly active tech community, with meetups happening most nights of the week. They range from general tech industry meetups to more specific, topic-based groups. I had been an active member for years, before deciding there was a niche yet to met. After a year of existing as a women in tech meetup, I met Lindsay High through our mutual friend, Catlin Williams, and we expanded the idea to be women of all industries, backgrounds, skillsets and more. Shine became a more generalized group, topic-wise, and began to focus on advocating for, and developing skills and knowledge around the workplace. Mid-2018, we expanded again, choosing to include topics like Building Resiliency, Intention Setting and Self Care. 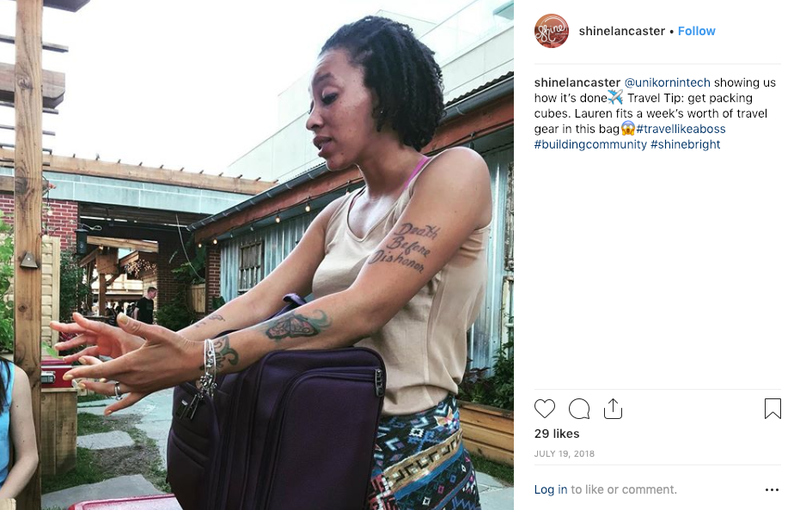 Shine meets for a Shine Supper every three months, holding space for conversation and relationship-making among 10-12 women in a local, women-owned restaurant and for Shine Sessions the month following a Shine Supper. Shine Sessions are open to 15-20 individuals and are typically free to attend. Topics are presented on by members of the community, and space is held for Q&A, meaningful conversation and more. Shine Suppers are held every three months at a local, woman-owned restaurant. We purposely limit tickets to ten seats to create a casual environment to connect. We kick off the evening with a mindful icebreaker, and allow the conversation to flow as it does. Shine Suppers came from an acknowledgment in our attendees that finding space to connect with others, outside of work, gets tough as an adult.